If you are considering in-house drum lessons in Toronto you have most likely put some thought into purchasing a drum kit of your own. After all, most drum lesson instructors won’t be travelling around the city with the necessary kit strapped to their backs. Once you have decided to buy a drum kit, you now have the decision of whether to buy Acoustic or Studio Drums. Studio drums are also referred to as digital or electric drum kits, and present several inherent advantages over a standard acoustic kit. This is especially true for the novice drummer who will benefit from the versatility and out of the box playability they provide. Studio drums offer a wide selection of programmable sounds known as ‘drum kits’ that allow the user to alter their vibe at the push of a button. Electric drums have also come along way and now feature realism that is second to none. Studio kits pass the blindfold test with flying colours in terms of drummer feel. A studio drum kit is great for parents as well – for three reasons. Firstly, they are very cost effective and present a worry-free way to get children into drumming. 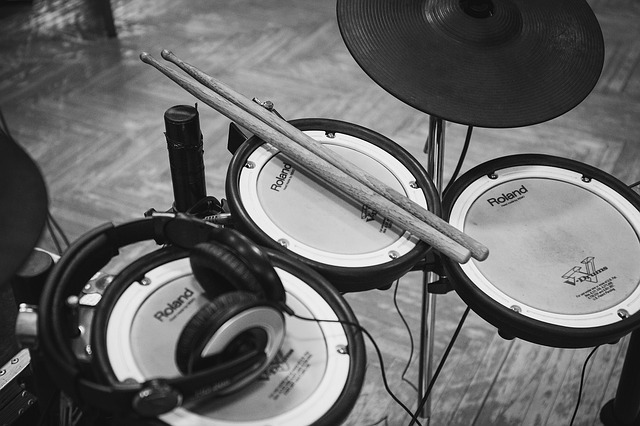 Secondly, electric drums are much smaller than their acoustic counterparts and are great for saving space. The third reason, and probably the most important of them all, is the adjustable volume and the ability to listen through headphones. This allows for practice at anytime without disturbing everyone else in the home. Upbeat Piano Studio teachers are big fans of Studio Drums for their sound, feel and convenience, making them the ideal choice for the aspiring drummer.